Before ending up in the region’s best band as a teen, Bombino first picked up the guitar at age 10, when his family was living in exile in Algeria due the Tuareg Rebellion throughout the early 90s. Being away from home during this early period in his creative development cemented his focus on themes of empowerment and hope for the Tuareg community. 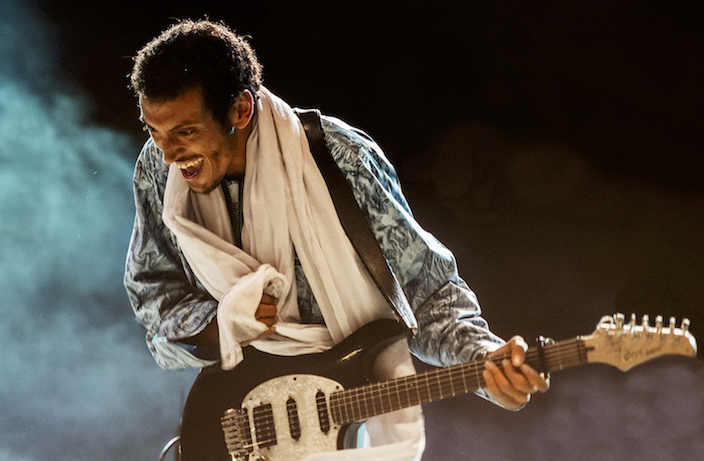 Bombino first garnered international attention with 2011’s Algadez, an album named after his hometown that brims with soaring blues guitar and his distinctively warm, raspy vocals. This record caught the ear of Dan Auerbach of the Black Keys, who teamed up with Bombino to produce the guitarist’s next album, Nomad, notable for its slick production and psychedelic bent. The guitarist then explored a new direction entirely, partnering with David Longstreth of the Dirty Projectors to produce 2016’s Azel, a unique piece of work that explores a hybrid genre Bombino invented with his band called tuareggae. Bombino sings exclusively in Tamasheq, the Tuareg language spoken along with its sister languages of Tamajaq and Tamahaq by approximately 1.2 million people across the most arid swath of West Africa. Singing in his native language is an essential element to the role he sees himself playing as a Tuareg musician in the international spotlight. Even so, he values starting a dialogue with his music, and focuses on making English and French translations of his work available – both in his song names on Spotify and the intros of his official music videos. This desire to sustain a dialogue spills over into Bombino’s excitement for his debut China tour this month, for which he’ll be visiting five cities around the mainland in one whirlwind week. Shanghai: Dec 10, 7.45pm, RMB180-380. Shanghai Symphony Orchestra Hall, see event listing. Beijing: Dec 12, 8pm, RMB120 presale, RMB140 door. Yugong Yishan, see event listing. Shenzhen: Dec 14, 8.30pm, RMB80 presale, RMB100 door. B10, see event listing. Guangzhou: Dec 15, 8pm, RMB80preale, RMB100 door. 191 Space, see event listing.